Despite the expansion of laparoscopic approach in the treatment of liver tumors, limited data have been reported regarding large colorectal liver metastases (CRLMs). This study aimed at assessing the short- and long-term outcomes after laparoscopic liver resection (LLR) for large (≥5 cm) CRLMs. This was a case-matched study (1:2) comparing patients with large (group L; ≥5 cm) and small (group S; <5 cm) CRLMs using demographic, tumor, and surgical characteristics as matching variables. Postoperative outcomes and survival data were compared in the 2 groups. Forty patients who underwent LLR for large CRLMs were matched with 80 patients with tumors <5 cm. Major hepatectomy was performed with 75.0 % of patients in Group L and 66.3 % in group S (p = 0.403). Operative time was 300 min in group L and 240 min in group S (p = 0.059). 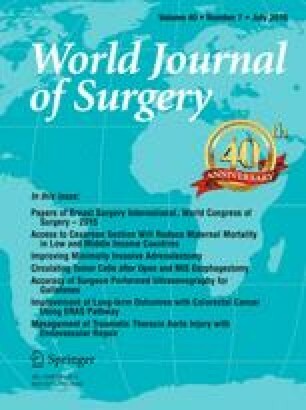 The postoperative mortality and overall morbidity rates were comparable in the 2 groups (p = 1.000 and 0.170, respectively). Postoperative major complication (Dindo–Clavien ≥3) was similar between the two groups (p = 0.072). R0 resection was achieved in 92.5 % in the group L and in 95.0 % in the group S (p = 1.000). The 5-year overall survival and recurrence-free survival were better for group S than for group L (47.3 vs. 35.4 %, p = 0.044 and 27.3 vs. 14.9 %, p = 0.042, respectively). Multivariate analysis identified positive surgical margins and synchronous presentation as prognostic factors. Since LLR was performed safely with favorable oncological adequacy in selected patients with large CRLMs, tumor size should not modify the surgical approach. The authors thank Mahendran Govindasamy and Yoshikuni Kawaguchi for coordinating the patients’ follow-up and maintaining the prospective database that formed the basis of this study. TN, DF, DH, CL, and YN have no conflicts of interest. BG received royalties for “Gayet bipolar forceps” (MicroFrance BG-CEV134, Integra, Plainsboro, NJ).